People love sharing their customer support horror stories. As a business gets bigger there are bound to be problems and when you're running a transaction-based storefront there are bound to be even more problems. In the case of EA and Origin and couple of individuals decided to share their run-in with EA's rather odd customer support for Origin on Reddit, and it's a sad, sad thing. Now these scenarios could technically happen to any company, but what's so bad about it is that it drives home the very negative connotations gamers place atop the shoulders of EA. The first instance is about a fellow trying to get his account restored after he was on the receiving end of a potential hack attack. He goes back and forth in a slow build of rising tension between him and a customer support rep named Akhil. Things start off with the basic questions and answers about the account, but then things turn into a sour pickle jar when Akhil begins asking for confirmation of the account, the user provides the basics including date of birth, CD-key verification and his secret question and secret answer. However, he still fails to get his account back, as showcased in the exchange below. So where does he get stuck? Not with information that actually matters, but because he can't remember all the guys on his team in FIFA 13. I don't really know if that's some sort of troll attempt or if support really does fail that hard. Who on Earth can remember every single name, position and staff type of each person in their club? That's a bit insane and I'm tempted to think the whole thing is a fake, as it would be impossible for anyone to remember that kind of information. 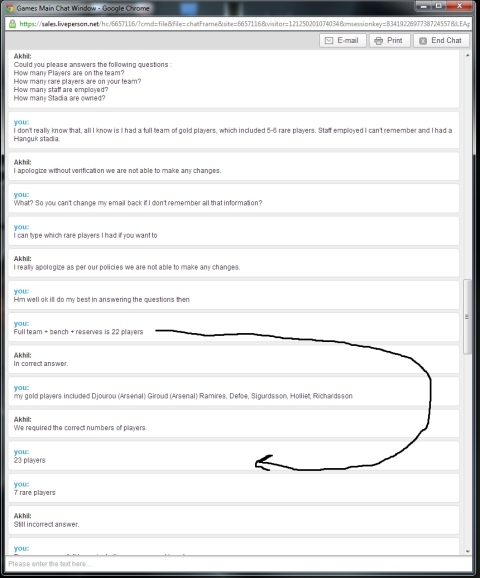 If it's not fake then EA has some really terrible customer support. The second encounter is a run-in with Origin support and an attempt to close out an account. This case seems 100% legit, as the user finds out that an Origin account has been created using his e-mail address and decides to contact customer support after receiving a couple of promotional e-mails from EA. In his quest to close out the account, he runs into a little opposition, check it out below. I do agree with customer support insofar that with the user having control of the account they can just easily reset the password to something impossible and call it a day, but I suppose the real issue is privacy concerns. If someone can access the account using your e-mail then you're not really safe are you? Either you or Valve has the right to terminate or cancel your Account or a particular Subscription at any time. You understand and agree that the cancellation of your Account or a particular Subscription is your sole right and remedy with respect to any dispute with Valve. Just contact customer support and watch the fireworks fly. Managing accounts in Origin has come under fire before, especially when account closures were attached to forum misconduct, which resulted in a firestorm that even Howie Long wasn't tough enough to put out. There have been rumblings, however, that EA handles support much faster than Steam but it doesn't sound like they are as effective at resolving the problem. I've never had any problems getting in contact with Steam's support, however I can confirm from first-hand experience that getting in contact with EA that involves some of their less reputable practices will leave you out in the cold without a shoulder to cry on.